Curvilinear tooth profile for improved stress distribution. Reduced tooth jump due to deeper tooth design. 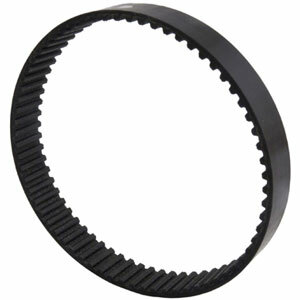 High efficiency due to positive engagement between belt teeth and the pulley grooves. No re-tensioning required. - Free from maintenance. - Increased power transmission capacity. The XL 037 belt is 3/8" wide (9.5mm) and has a pitch of 5.08 (tooth centres) with a toothed depth of 1.27 and is 2.4 thick.